The cancellation late last week of US Secretary of State Mike Pompeo’s next visit to North Korea was apparently motivated by a letter sent by top North Korean officials indicating their wariness about the success of future talks. 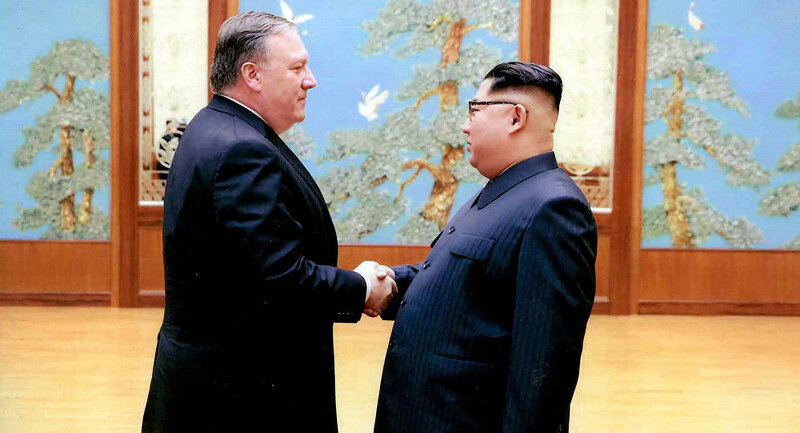 The Washington Post reported Monday, citing two unnamed senior US administration officials, that Pompeo received the letter from Kim Yong Chol, vice chairman of the Korean Workers Party Central Committee, the ruling party that governs North Korea. The letter is said to have arrived just hours after Pompeo's next trip was announced. The letter reportedly warned that denuclearization talks between the two countries were "again at stake and may fall apart" and that the process could not move forward, CNN reported Tuesday, citing people familiar with the matter. "The US is still not ready to meet [North Korean] expectations in terms of taking a step forward to sign a peace treaty," CNN cited the letter as saying. The news agency said the letter also indicated that if a compromise could not be reached, North Korea might resume its missile and nuclear programs, which it has already taken major steps toward dismantling, in accordance with the June 12 agreement in Singapore. Following US President Donald Trump's cancellation of the trip last Friday, North Korean state newspaper Rodong Sinmun expressed the government's position, accusing the US of "double-dealing" and "hatching a criminal plot" against Pyongyang, Sputnik reported. It also claimed the US and Japan were engaged in military exercises that rehearsed an attack on the North Korean capital. The US and South Korean forces regularly drill for such scenarios. "Such acts prove that the US is hatching a criminal plot to unleash a war against the DPRK and commit a crime which deserves merciless divine punishment in case the US fails in the scenario of the DPRK's unjust and brigandish denuclearization first," the newspaper said. The Democratic People's Republic of Korea (DPRK) is North Korea's official name. While the shooting war between the US and South Korea on one side, and North Korea and China on the other, ended in 1953, no formal peace treaty has ever been signed, hampering efforts at normalization of relations. North Korea has said that a permanent peace treaty is crucial to lowering military tensions on the peninsula, but the US maintains that the North's nuclear weapons program is an obstacle to signing a peace treaty. North Korea, in turn, says its nuclear weapons are purely for self-defense as a security guarantee until a permanent peace treaty is in place. At the Singapore summit between Trump and Kim on June 12, the two leaders reached four points of agreement: a commitment to establish bilateral relations "in accordance with the desire of the peoples of the two countries for peace and prosperity"; joint efforts "to build a lasting and stable peace regime on the Korean Peninsula"; reaffirmation of the April 27 Panmunjom Declaration and a commitment to "work towards complete denuclearization of the Korean Peninsula"; and repatriation of soldiers' remains, Sputnik reported. The North Korean government maintains a measure-for-measure policy of commensurate actions, and so far, "In almost all of the give-and-take, the ‘give' has come from North Korea," Dr. Christine Hong, associate professor of critical race and ethnic studies at the University of California Santa Cruz and a member of the Korea Policy Institute, told Radio Sputnik earlier this week. The professor told Sputnik Tuesday in a separate comment that North Korea's previous actions, such as the repatriation of the remains of 55 American servicemen late last month, were "a profound act of good faith on the part of North Korea, which suffered the loss of millions due to a criminal US bombing campaign in the early 1950s, and one in keeping with its stated measure-for-measure engagement protocols with the United States." "North Korea strongly hoped — as did South Korea's Moon Jae-in administration — that the Trump administration would have been willing, in a commensurate good-faith gesture, to take steps to bring the as-yet-unended Korean War to a close," the expert noted, further pointing out that the United States, despite positioning itself as adjacent to the inter-Korean peace process, actually "plays a decisive role in bringing the Korean War to an end." "The United States, unlike South Korea, was one of three signatories to the armistice agreement [that ended the fighting in the Korean War] — the other two being North Korea and China," she noted. "What we are witnessing now is a return to US policy as usual. Far from being a spectator to an inter-Korean peace process, the Trump administration, as its skewed portrayal of North Korea's request for a peaceful resolution to the Korean War as ‘belligerent' reveals, is playing an obstructionist role, all during a time of historic inter-Korean rapprochement," Hong told Sputnik. "In this moment, Trump is reverting to his predecessor Barack Obama's 'strategic patience' (aka 'maximum pressure') policy. This is a tragic miscalculation — one that goes against the desires of the Korean people for peace. In this rare window in which the two Koreas have signaled to the world their hopes for peace and reunification, not only has Trump imperiously thrown a wrench into the peace process, but also the bipartisan war party in Congress has stood up and pledged allegiance to the military-industrial complex by refusing Trump the authority to draw down troops from South Korea." "Seventy-five years ago, in Cairo, the United States, Great Britain and the Chiang government in China arrogantly stated that the peoples of Korea… would ‘in due course… become free and independent,'" Hong said. "Isn't it high time for the United States to make good on this long overdue promise?"